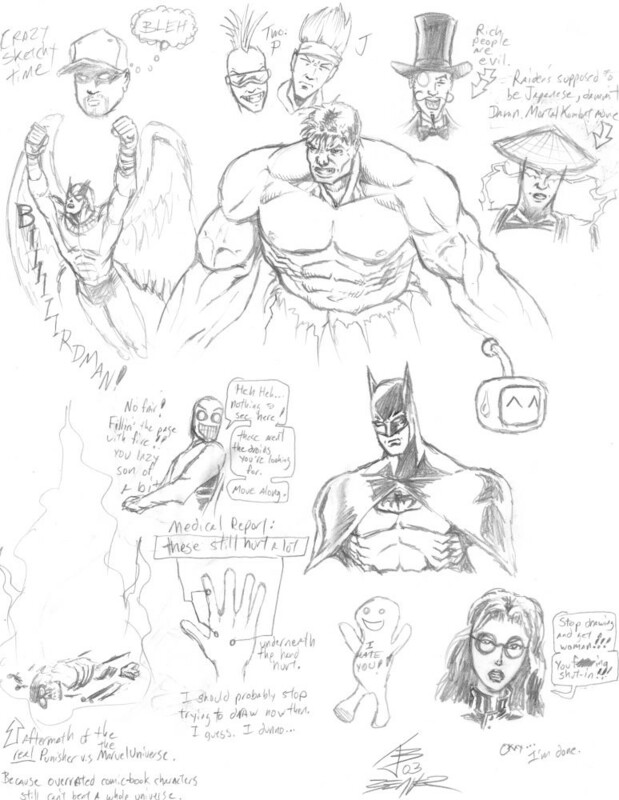 This was the first of what should've been oodles of doodle pages. If only all of them were this insanely random. Most of this is obvious stuff that needs no explanation except for a few bits. That thing with the hand was from a moving accident that damn hurt my drawing hand and still gives me a bit of trouble even now. That lil' mascot is is Pit-Pat, the proposed mascot for Globochem from a 1st season episode of hilarious Mr. Show with Bob and David. That burning Punisher skeleton? There was a What If? book with an alternate universe Punisher taking on an alternate Marvel Universe and pretty much killing alternate everybody because his family was killed during an Avengers vs. aliens fight. Yes, he kills all the people who'd be able to stop the next alien invasion and leaves Earth as easy pickin's. Idjit. Oh, and Nutroll's in this! In typical Nutroll fashion, he's trying to cover up the amount of fire that I drew to fill space instead of the burning remains. Even Nutroll knows that was the TRUE crime of the page.